We understand that divorce is a difficult time. Let Haskins Becker, P.C. help you through the process of filing as well as with the tough decisions you need to make about your children and property. We take pride in helping our clients through a stressful time. You need a divorce lawyer that understands your situation. Divorce is a stressful time. We know you have concerns about your children, property and finances and are wondering how to move forward. With our focus only on family law, Haskins Becker, P.C. has the experience necessary to determine how the law applies to your unique situation. 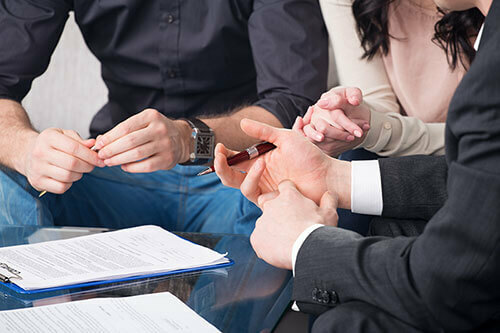 We will provide you with the empathy, support and effective representation you need to navigate through the challenging legal issues related to divorce or separation. Haskins Becker, P.C. has worked with clients in Chicago and the suburbs, including Naperville, Oak Brook and Wheaton. As a family lawyer our legal services include child support, child custody, visitation, property division, financial issues related to divorce, as well as post-dissolution modifications and pre- and post-nuptial agreements. Please contact us today to let us know how we can help you. Let’s discuss your legal matter so we can better understand how to meet your needs. From our office in Wheaton, IL the divorce and family law firm of Haskins Becker, P.C. works with businesses and clients throughout the Chicago area, including Addison, Arlington Heights, Aurora, Batavia, Bartlett, Bensenville, Bloomingdale, Bolingbrook, Bridgeview, Carol Stream, Chicago, Clarendon Hills, Darien, Des Plaines, Downers Grove, Elmhurst, Evergreen Park, Glen Ellyn, Glendale Heights, Glenview, Hanover Park, Harwood Heights, Hinsdale, Homer Glen, Itasca, Joliet, Lisle, Lockport, Lombard, Naperville, New Lenox, Oak Brook, Oak Lawn, Oak Park, Orland Park, Palos, Park Ridge, Plainfield, Rolling Meadows, Roselle, St. Charles, Streamwood, Villa Park, Warrenville, Westmont, West Chicago, Wheaton, Winfield, Wood Dale, Woodridge and Yorkville. Haskins Becker, P.C. also practices divorce and family law in Cook County, DuPage County, Kane County, Kendall County, and Will County.